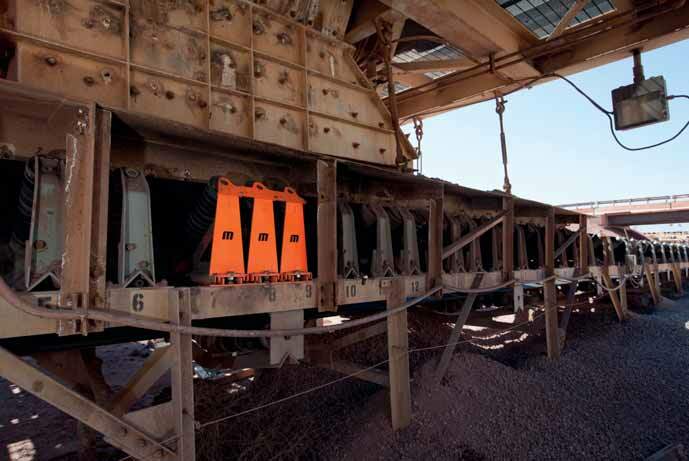 A new high speed impact cradle is designed to reduce roller and frame damage from heavy conveyor loading conditions in mining, coal handling, aggregates and other applications involving dense materials and/or high volumes. The rugged EVO® High Speed Impact Cradle is engineered to withstand brutal operating conditions, reducing roller failures and service requirements. One customer estimates that the new cradles from Martin Engineering paid for themselves in just the first week of service at the company’s copper handling facility, due to the savings in maintenance and downtime. “Under high-volume conditions, standard OEM impact idlers in the load zone simply can’t withstand heavy loads and lengthy drops, costing downtime for repairs as well as the expense of replacement components,” observed Martin Engineering Service Technician Doug Brown. The new cradles use Martin Engineering’s Trac-mountTM technology to slide in and out easily for maintenance. The modular components are light enough to be removed by hand, without using a crane or other equipment to handle them. The innovative load zone design uses an elastomer bar suspension system that absorbs and distributes the material load being transferred, greatly reducing the stress on the idlers’ rolling components and support structure. One patent- pending design innovation is the use of connecting brackets near the top of the idler frame to hold the three rollers together. These special brackets are designed to allow multiple modular cradles to be tied together, so that the idlers throughout the entire load zone work together as a system. Founded in 1944, Martin Engineering is a major supplier, making bulk materials handling cleaner, safer and more productive. The company supplies flow aids and conveyor products around the world for a wide variety of bulk material applications, including coal, cement/clinker, rock/aggregate, biomass, grain, pharmaceuticals, food and other materials. The firm is headquartered in Neponset, IL, offering manufacturing, sales and service from factory-owned business units in Brazil, China, France, Germany, Indonesia, Mexico, South Africa,Turkey, India and the UK, and under exclusive licence with ESS Australia.